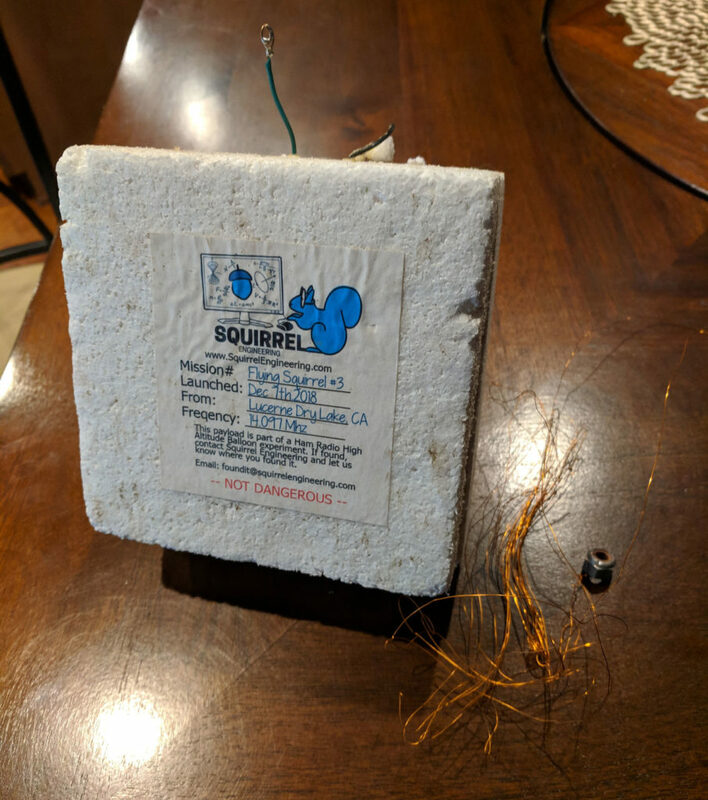 Home / Flying Squirrels / FS#3 has been recovered! He is one dirty squirrel! Our brave, and lucky squirrel is badly in need of a bath, but otherwise is in good shape and happily resting at home. FS3 launched at 10:29Am Dec 7th, 2018 and was performing very well as it flew over the tall San Bernardino Mountains to the west of our launch point. One hour and 24 minutes into the flight at an altitude of 28,855 ft (9,100m) contact with FS3 was abruptly cut off in mid transmission. Outside temperatures were -22f at that moment. Despite a search in a predicted landing area, we never heard from our Squirrel again. Exactly 1 month later FS3 was found by Greg C. near Yucaipa, CA. After a few email exchanges with his friend Evelyn P. arrangements were made to return FS3 back home. I am very grateful to Evelyn & Greg for finding the payload and reaching out to contact me. Without their help, the sudden failure would remain a mystery. What had happened to FS3 was the subject of speculation amongst the launch team and followers of the project. 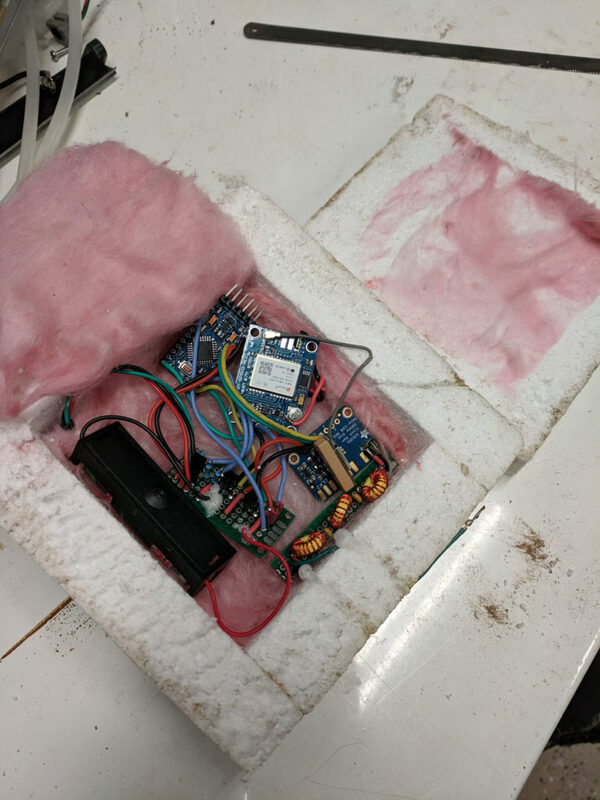 The team speculated that the payload may have frozen to death, or perhaps the balloon popped, and the antenna became tangled during the fall and thus shorting it out. Now with our Squirrel back home it is clear what went wrong. Greg told me he found FS3 on his property near a fence. He told me that found no remains of the balloon, just the Styrofoam box and wire. If you look at the picture above, you will see the green wire with a loop in it. This is the point that the upper half of the antenna formed the connection between the payload and the balloon. This antenna wire and the balloon are completely missing. 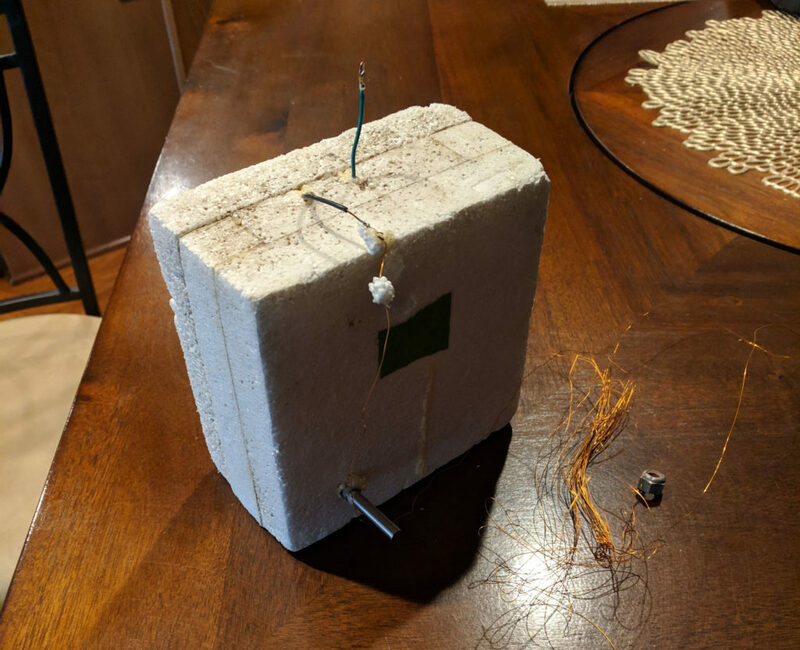 Under the stress of the winds, the wire had apparently snapped off, causing the payload to fall back to earth some 5.6 miles south of the last known location. The balloon and the upper half of the antenna went on to balloon heaven, whereabouts unknown. I opened up the Squirrel on the work bench and found the insides perfectly clean, despite several wet storms in the area since its flight. The payload box was watertight. After recharging the battery and powering up, all systems were functioning. FS3 did not freeze to death. The remaining antenna wire was not badly kinked or tangled, so this eliminates the tangled up theory. Missing the upper half of the antenna, which turns out to be the driven element, FS3 just did not have a workable antenna to radiate a signal. FS3 is now living a happy quiet life in retirement.